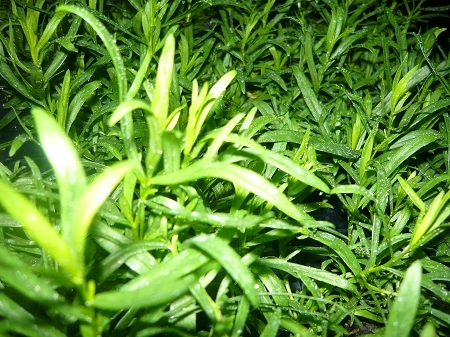 French Tarragon (Artemisia dracunculus sativa) - Slender green leaves with a distinctive anise flavor. This much sought after culinary herb is used in sauces, meat dishes, vinegars, stuffings, marinades, etc. We sell true french tarragon which cannot be propogated from seed. Cool weather herb does not grow well during the hottest summer months. Perennial zones 4-7. Live plant in 3 inch container.